To draw the human body correctly and have a clear idea of the movements they can develop, it is necessary to have a certain knowledge of their internal structure. 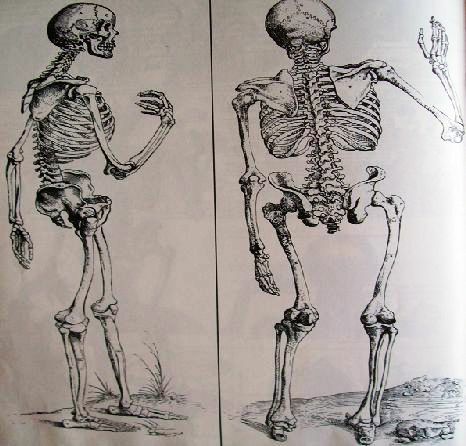 It is a good idea to study the position of bones using anatomy images. This will help us get a clear picture of body proportion. It is important to notice joints. Those that end in the shape of a ball allow a full turn of this member: this is the way the shoulder and leg is placed. The neck allows this turn as well. However, notice the joints at the elbows and knees. You will see that they only allow the lower part of the limb to move in one direction. Speaking about the spinal cord, it is not straight. It forms an "S" entering the lumbar zone (more prominent in females). It is not rigid; it can be bent and turned.